The GoFlo® unit is designed to remove refueling infrastructure barriers, giving fleet operators easy access to compressed natural gas as a transportation fuel. 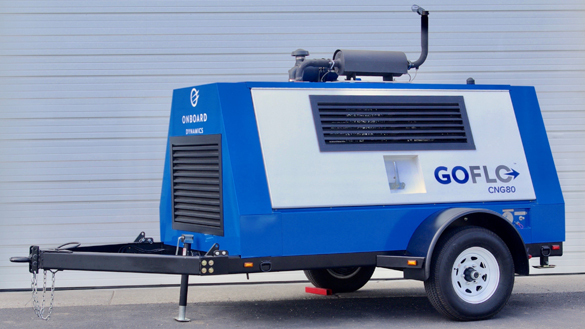 With the GoFlo mobile compressor, operators have a modular, affordable and scalable solution for compressing low-pressure natural gas into a compressed, usable fuel. Lower fuel costs and total cost of ownership save money for fleets using < 400 GGE/day (based on 10 hour day operation). Can easily be scaled by adding additional units to meet capacity requirements. Self-powered with clean-burning natural gas. No electric service necessary. Minimal permitting and installation requirements. Trailer-mounted system can be easily deployed to multiple fleet locations, using a standard half-ton pickup truck.